Are the Dansgaard-Oeschger (D-O) Warm Events driven by Lunar Tides? What are Dansgaard-Oeschger (D-O) Warm Events ? 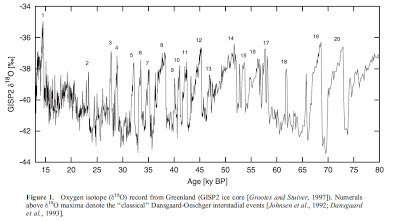 D-O warm events are abrupt increases in temperature to near-inter-glacial conditions that occurred during the last Ice-Age. These temperature increases occurred in a matter of decades and they were quickly followed by a period of gradual cooling. What are some possible explanations for the D-O Events? b) internal oscillations within the climate system. # If the 1,470 year cycles originate within the Earth system, we would also expect the period to change as the background moves from full glacial to inter-glacial conditions. # In contrast, orbital cycles are highly regular and so they would not be expected to change between glacial and inter-glacial conditions. § The D-O events are discrete events paced by a regular cycle of 1470 years. § The five most recent events, arguably the best dated, have a standard deviation of only 32 years (2 %) about a 1470 year spacing. 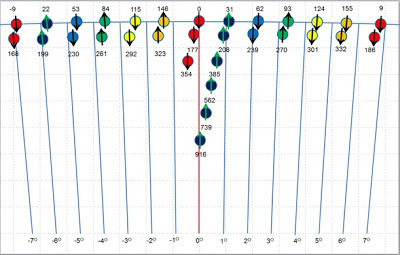 § This level of precision points to the orbital cycle explanation. § The 1,832 Lunar tidal cycle proposed by Keeling and Whorf (1998) cannot be reconciled with the 1,470 year spacing found in the Greenland ice-core data. § The origin of the regular pacing of this phenomenon remains a mystery. 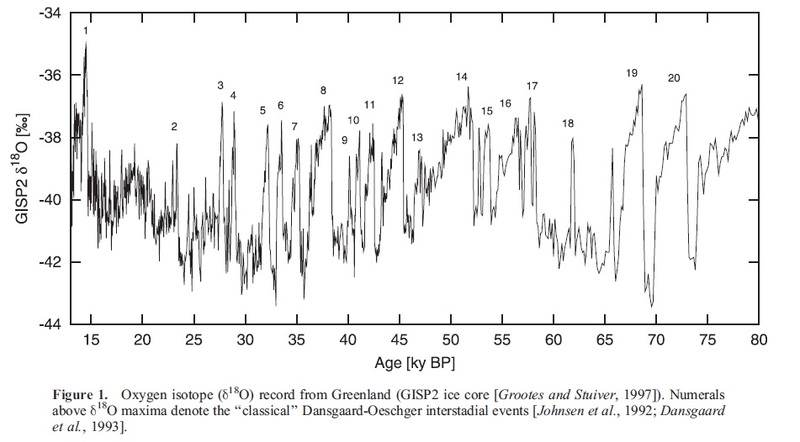 Are D-O Events Still Present in the Holocene? D-O/Bond Event should begin about 2150 A.D.! So if the 1832 year cycle in the ABSOLUTE lunar tidal strength does not appear to provide the right external synchronization time needed for the 1470 year D-O Events, can the Lunar tides still play a role ? The answer is yes, if we are prepared to make a paradigm shift! What happens if instead of looking for cycles in the absolute strength of lunar tides, we look for cycles in the strength of the lunar tides that are synchronized with the seasons? This means that if we start out with a New Moon (i.e. Syzygy - when the Earth, Moon and Sun are aligned) at closest Perigee (i.e. when the Moon is closest to the Earth) at the time of Perihelion (i.e. when the Earth is closest to the Sun) on or about January 1st, how long does it take before the New Moon returns to the same precise alignment with the seasons? § One Full Moon Cycle (FMC) is the time required for the point of Perigee in the Lunar orbit to re-align with the Sun. § As the Earth revolves around the Sun, the Line-of-Apsides very slowly turns in a clock-wise direction. This motion is caused by the precession of the Line-of-Apsides of the Lunar orbit around the Earth, once every 8.8502 Sidereal years, as measured with respect to the stars. It is known as the Cycle of Lunar Perigee. § The Perigee-Syzygy-Perihelion Cycle is the time required for a Full (or New Moon) at Perigee to re-occur at or very near to the time of Perihelion. The Perigee-Syzygy-Perihelion Cycle is one lunar tidal cycle that is known to precisely realign with the seasons. 157.00 FMC’s = 177.00 Tropical years. What happens when we extend the 177.00 year Perigee-Perihelion Cycle over longer time periods? § The following plot shows the Earth’s position in its orbit when it is ≤ seven days from the 1st of January near Perihelion. § All FMC's (where Perigee either points directly at the Sun or directly away) are shown up to 354 (= 2 x 177.00 ) years. § The FMC's that are separated from their predecessor by 9.0 years are shown in the same colour. § The FMC's in the sequence 31, 208, 385…. years are extended until the Perigee- Perihelion cycle is almost precisely reset after 916.00 years. § Of course, this is only half of the Full reset cycle since the perigee points directly at the Sun at 0.00 years and it points directly away from the Sun after 916.00 years. § Hence, the full reset time for the Perigee-Perihelion cycle is 1832.00 years. This the famous Keeling & Whorf 1800 year tidal cycle. 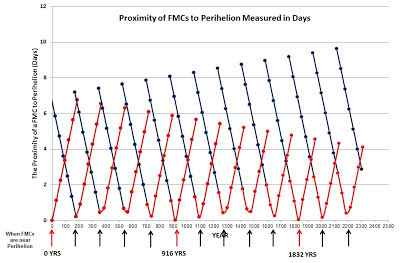 The next graph re-plots the data in the previous graph to show how the proximity of a given FMC event is to Perihelion changes over time. 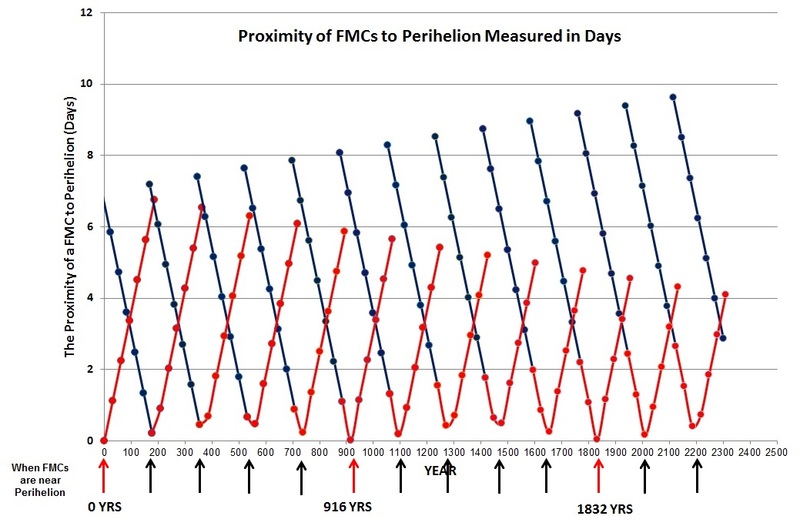 Note: The strongest lunar tides occur when the FMCs occurs at or very near to Perihelion, once every 177 years. These times are marked in the following diagram with vertical arrows. 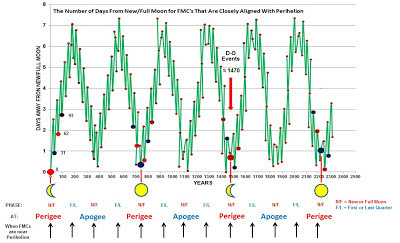 § The next slide shows the number days that the phase of the Moon is from being New or Full, for each of the FMC's that are at (or near to) Perihelion. The graph starts out with a New Moon at Perigee on January 1st (near to Perihelion on January 3rd) in the year 0.00. 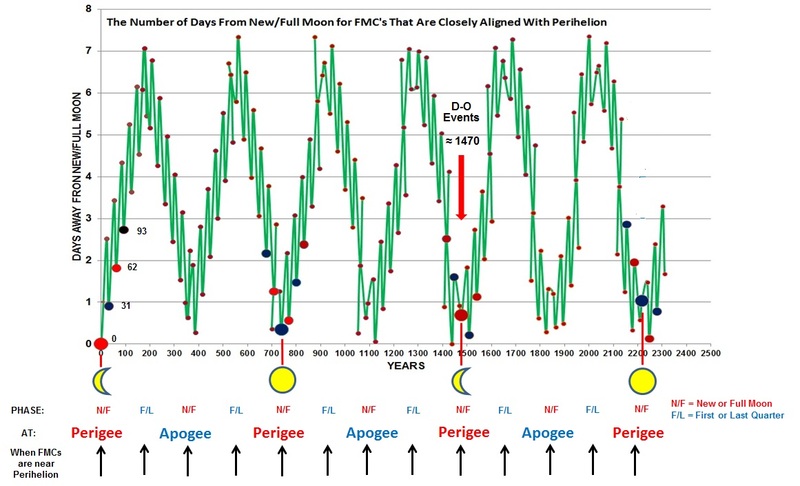 § New or Full Moons that re-occur for FMC's at (or near to) Perihelion that are whole multiples of 739 years (i.e. 0.0, 739.0, 1478.0 and 2217.0 years) after the starting date, always occur at lunar Perigee. Hence, if we look for cycles in the strength of the lunar tides that are synchronized with the seasons, rather than cycles in the absolute strength of lunar tides, we find that there is a natural 1470 year tidal cycle. This supports the contention that Dansgaard-Oeschger (D-O) Warm Events are being driven by a 1470 year periodicity in the long-term Lunar Tides! "We know that the strongest planetary tidal forces acting on the lunar orbit come from the planets Venus, Mars and Jupiter. In addition, we known that, over the last 4.6 billion years, the Moon has slowly receded from the Earth. During the course of this lunar recession, there have been times when the orbital periods of Venus, Mars and Jupiter have been in resonance(s) with the precession rate for the line-of-nodes the lunar orbit (Cuk 2007). When these resonances have occurred, they would have greatly amplified the effects of the planetary tidal forces upon the lunar orbit (Cuk 2007). Hence, the observed synchronization between the precession rate of the line-of-nodes of the lunar orbit and the orbital periods of Venus, Earth, Mars and Jupiter, could simply be a cumulative fossil record left behind by these historical resonances." 1. Synchronization of the Draconic year with the Jupiter's orbital period. 2. The source of excitation for the Chandler Wobble is extra-terrestrial. The Earth has two distinct short-term wobbles. The first is the annual wobble which is a forced motion caused by the seasonal variations in the Earth’s atmosphere, oceans and hydrosphere. The second is a periodic wobble of the Earth’s polar axis with an average period of 433 days known as the Chandler Wobble (Gross 2000). This wobble is thought to be a free oscillation of the Earth’s rotation axis caused by the fact that the Earth does not rotate about its figure axis. Dissipation processes associated with wobble-induced deformations of the solid Earth should cause the Chandler wobble to freely decay on a timescale of about 30-100 years (Plag et. al. 2005), unless some force is acting to reinvigorate it. The fact that there has been no noticeable decay in the Chandler Wobble has raised questions about the source of excitation for the wobble. Gross (2000) proposed that the wobble was excited by a combination of atmospheric and oceanic processes, with the dominant excitation mechanism being ocean-bottom pressure fluctuations. The Chandler Wobble also suffers from a sinusoidal variation in its amplitude that has a period of roughly 6.4 years (Kosek 2005). It is generally believed that the 6.4 year amplitude modulation period is most likely just a beat period produced by the interaction the annual oscillation and Chandler Wobble (Kosek 2005) but what if the source of excitation for the Chandler Wobble had an extra-terrestrial origin? [N.B. the point in the Earth’s orbit that is 1 ¼ DY's after the position of the Earth on January 1st, subsequently rotates around the Sun (with respect to the stars) once every 6.3699 years. This is just over three hundredths of year less than the time required for the realignment of the positions of the three largest terrestrial planets]. This means that these four planets return to the same relative orbital configuration once every 44.77 years. 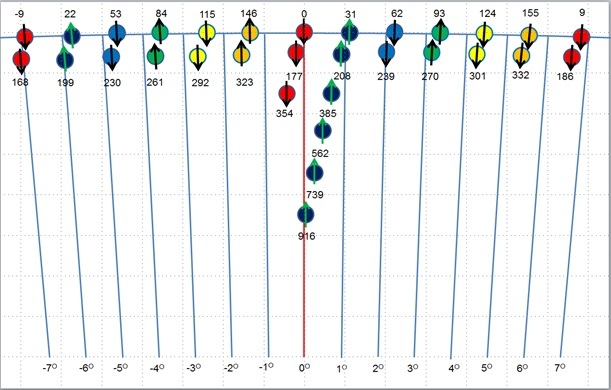 There is a possibility that the 6.40 year realignment period for the terrestrial planets has interacted with the sidereal orbital period of the Earth/Moon system over the eons, to produce a side-lobe modulation that it has slowly nudged the precession rate of the line-of-nodes of the lunar orbit towards its current value. Hence, we now have a precession rate that varies on a time scale of 1 ¼ TD = 433.2751 days = 1.18622 years. The fact this so close to the nominal 433 day period of the Chandler Wobble, suggests that the variations in lunar tides produced by the precession of the line-of-nodes of the lunar orbit could, in fact, be the source of the ocean-bottom pressure fluctuations that are thought to be responsible for the excitation of the Chandler Wobble. These last two relationships indicate that there may be a link between the relative orbital configurations of Jupiter, Venus and the Earth and variations in the terrestrial lunar tides. They also indicate the tidal variations could be responsible for setting the periods for the Chandler Wobble and the QBO. Cuk, M. 2007, Excitation of Lunar Eccentricity by Planetary Resonances, Science, 318, 244. Gross, R.S., 2000, The excitation of the Chandler wobble, Geophysical Research Letters, Volume 27, Issue 15, p. 2329-2332. Kosek W., 2005, Excitation of the Chandler wobble by the geophysical annual cycle, Proc. ECGS Chandler Workshop, ed. H.-P. Plag, European Center for Geodynamics and Seismology, Luxembourg-city, 2005. Plag, H.-P., Chao, B.F., Gross, R.S., and Van Dam T., 2005, Forcing of Polar Motion in the Chandler Frequency Band: An Opportunity to Evaluate Inter-annual Climate Variations, Eos, Transactions American Geophysical Union, Volume 86, Issue 3, p. 26-26. Wilson, I.R.G., 2011, Are Changes in the Earth’s Rotation Rate Externally Driven and Do They Affect Climate? The General Science Journal, Dec 2011, p. 3811.